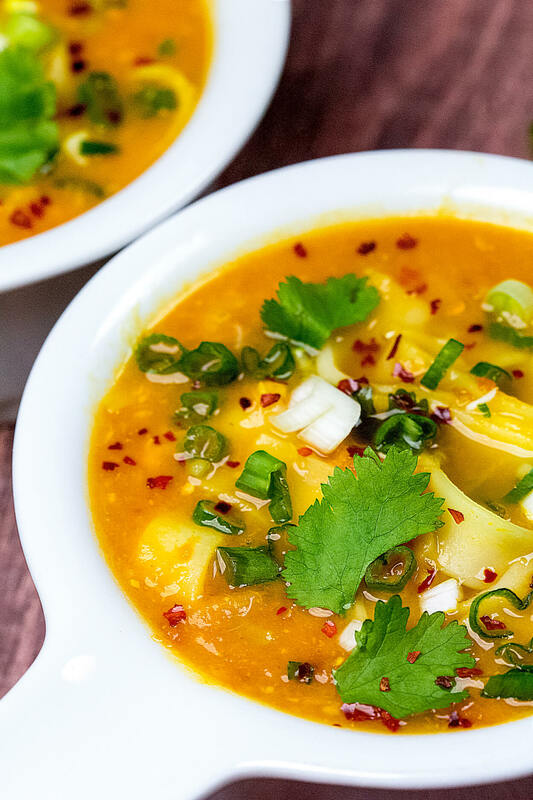 This Chickpea Coconut Curry Soup is bursting with flavour and easy to whip up in a pinch in the Instant Pot or on the stovetop. This comforting soup will keep you warm all Winter long! Happy 2018 guys! It’s my first recipe of the new year and I am so excited to share this cozy Coconut Chickpea Curry Soup with you! 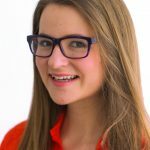 Is your year off to a good start? As many of us do in January, I love stocking up on healthy and simple meals. I gave you a sneak peak of the recipe on Sunday and it seems you all love cozy soups as much as I do! 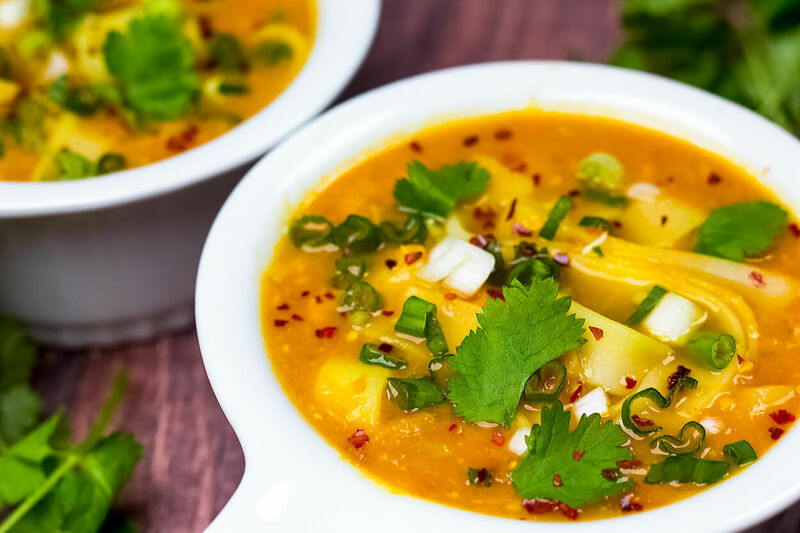 This Chickpea Coconut Curry Soup is made with fragrant spices and can be whipped up in a cinch on the stovetop – or in an Instant Pot. Do you cook with an Instant Pot? It’s basically a pressure cooker, rice cooker, yogurt maker, and magic-meal-machine all in one! My mom got me one last year for my birthday and I L-O-V-E it. It makes cooking beans, soup, and everything in between so incredibly easy with minimal clean up. Because after a day at the office, the last thing I want to do is spend hours in the kitchen (I save that for meal-prep and recipe-testing Sundays!). This recipe is actually based off of a soup I had at a work conference a few months back. The last morning of the event, we had a beautiful, bright yellow, vegan chickpea coconut soup I knew I had to recreate at home and share with you. If you make this Coconut Chickpea Curry at home, snap a photo and tag me #CearasKitchen on Instagram or leave your feedback below! Using the saute function, saute the onions, leeks, and garlic over medium heat with a splash of water until softened. Add the curry powder, turmeric powder, and cumin and sautee for about one minute until fragrant. Add the coconut milk, diced tomatoes, chickpeas, and vegetable broth. Using the manual or soup function, cook for 6 minutes. 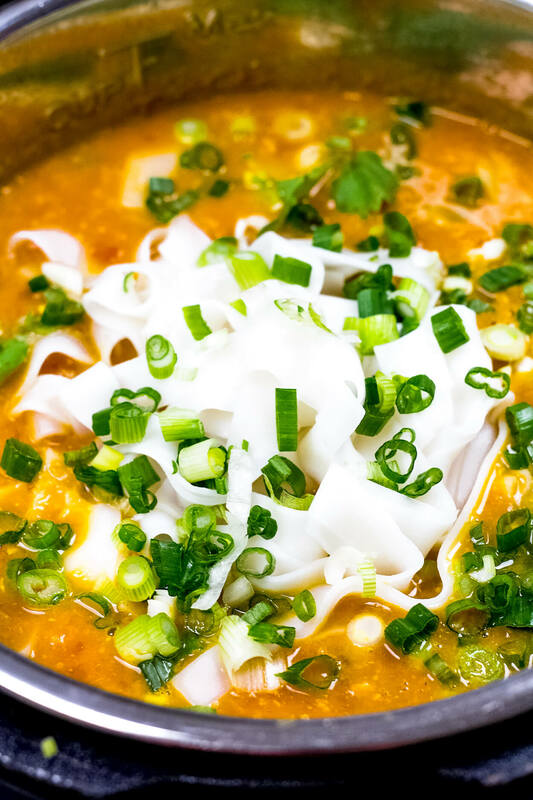 If adding to the soup, in a separate pot, cook the rice noodles until barely tender to bite. Release steam using the valve on top. Add the rice noodles to soup with lemon juice and a pinch of sea salt and pepper to taste. Serve warm with green onions, cilantro, and hot pepper flakes. In a medium stockpot, saute the onions, leeks, and garlic over medium heat with a splash of water until softened. Add the curry powder, turmeric powder, and cumin and sautee for about one minute until fragrant. Bring to a boil over high heat. Reduce the heat and simmer for 25 to 30 minutes. 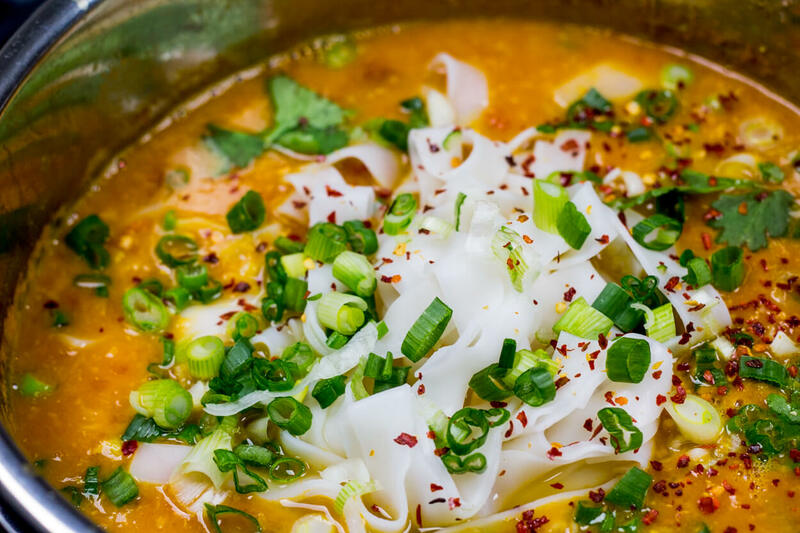 Add the rice noodles to soup with lemon juice and a pinch of sea salt and pepper to taste. 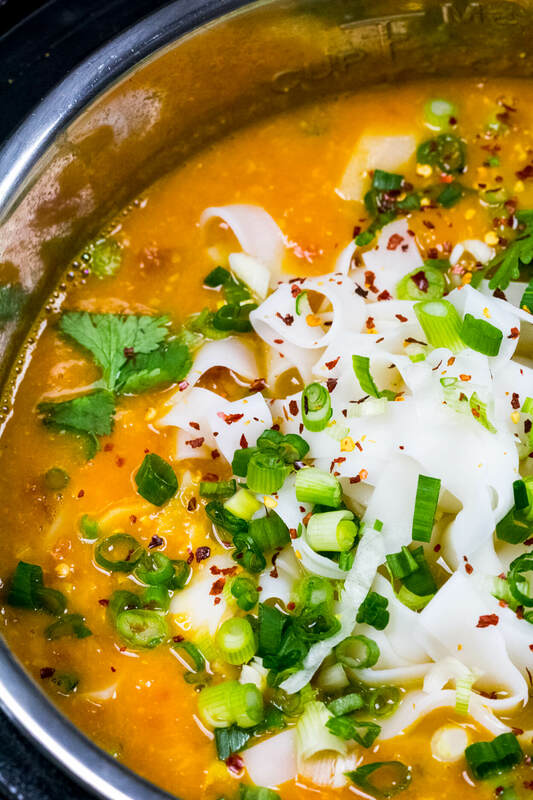 Serve warm with green onions, cilantro, and hot pepper flakes. Your chickpea curry soup is AMAZING…. THE FAMILY ABSOLUTELY LOVED IT.